UK PM May addressed lawmakers, repeated it's her deal or no deal. The UK Parliament will vote on three different amendments later today. The GBP/USD pair reached a daily high of 1.3245, but ended it in the red in the 1.3180 price zone, as Brexit uncertainty returned. There were some reports indicating that PM May could quit or be ousted, others suggesting that a general election was discussed within her Cabinet, and more suggesting that a third meaningful vote could be held on Tuesday, this last, later denied by May's spokesman. The UK PM addressed lawmakers, adding little new to what the market already knew. May reiterated that there are no chances of changing the withdrawal agreement, and that is either her deal approved between this week and the next one, or leaving without a deal, a scenario nor her, neither lawmakers desire. She mentioned that an alternative would be to pursue a different form of Brexit or a second referendum, quickly adding that "it is important Parliament abides by 2016 referendum result rather than talking about holding a second referendum," also adding that is very difficult to take Britain out of the UK against the Parliament´s will. May won't submit her deal for a third meaningful unless it gets enough support ahead of it. Speaker Bercow has selected three amendments to be voted early Asia. The UK macroeconomic calendar has nothing of relevance to offer this Tuesday. 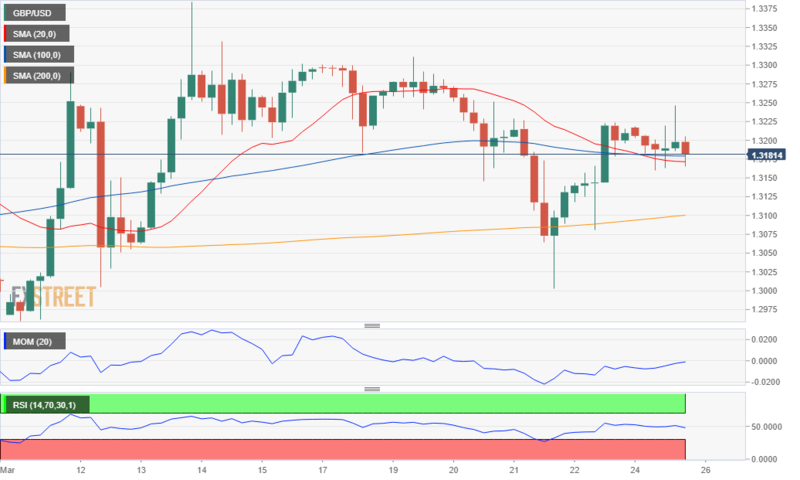 From a technical point of view and in the short-term, the pair is neutral-to-bullish, given that, in the 4 hours chart, a directionless 20 SMA acted as a dynamic support throughout the day, rejecting bears. Technical indicators in the mentioned chart are now pivoting around their midlines with limited directional strength. Hopes prevail despite the Brexit mess, that the UK will avoid a hard landing, therefore keeping the downside limited for the Pound. A long term ascendant trend line coming from January's low comes at around 1.3110 this Tuesday, with bears having more chances on a break below it.